DR. CALVIN BLACKMAN BRIDGES, the Carnegie Institution of Washington geneticist, knows a lot about bugs, for he breeds them and studies their mechanism under the microscope. But his hobby is Safety First and car building. His three-wheeled “Lightning Bug” is said to be crash and carbon-monoxide proof. It is small and squatty yet perfectly streamlined, with tail-light and license plates recessed and the Pyralin windows flush with the body. 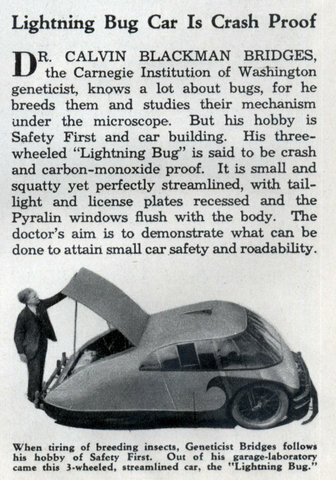 The doctor’s aim is to demonstrate what can be done to attain small car safety and readability. I don’t usually think of a 3-wheeler as a “safety” design. 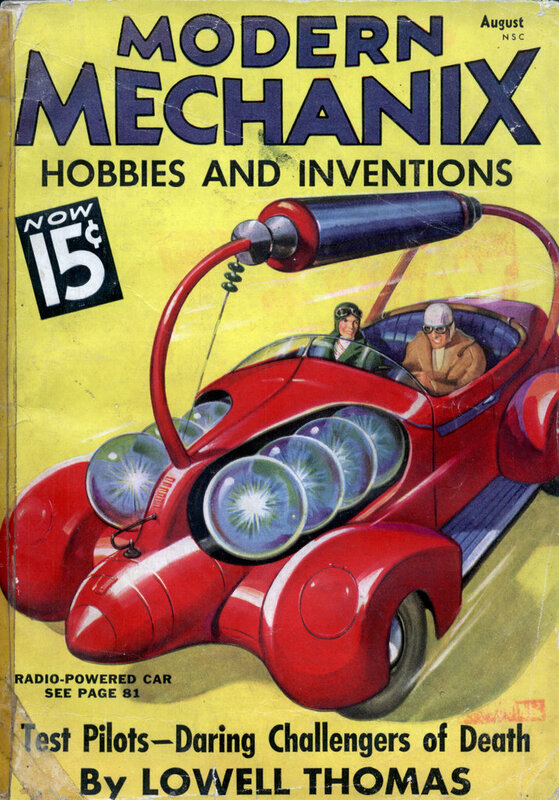 Also, it’s interesting how many early streamliners dispensed with a rear window. I wonder if this is rear-engined, or an early example of a hatchback. And the car is “crash proof” because…? the article was published in Aug, 1936? And he car has not been built yet? or is there a “Bug” being built goday? 3 wheeled vehicles are just safe or more so as 4 wheeled vehicles. The only reason, in my opinion, that 4 wheels has become more popular these days is due to money spent on matketing. Lastly, these 4 wheeled cars look like wagons. Remeber coach builders first started as wagon builders.